Grains mixed overnight. Corn up slightly, wheat unchanged, and beans up 3 cents. A holiday-shortened week as grain markets will be closed Wednesday night and Thursday in observance of Thanksgiving. Markets will re-open at 8:30am on Friday and will close early at 12:05/12:15pm CST. The USDA reported corn harvest at 90% complete, gaining 6% for the week. Harvest a year ago was 89% complete and the five year average is 93%. China/US trade relations remain at the forefront of news. Many traders remain optimistic that an agreement will return to normal US soy exports to China, but a return to normal, regardless of a deal, appears doubtful. The USDA estimates US winter wheat seeding is 93% complete versus 97% on average. Emergence is estimated at 81% versus 88% on average. The crop is rated 56% G/E, up 2 from last week. Last year was rated 53% G/E. 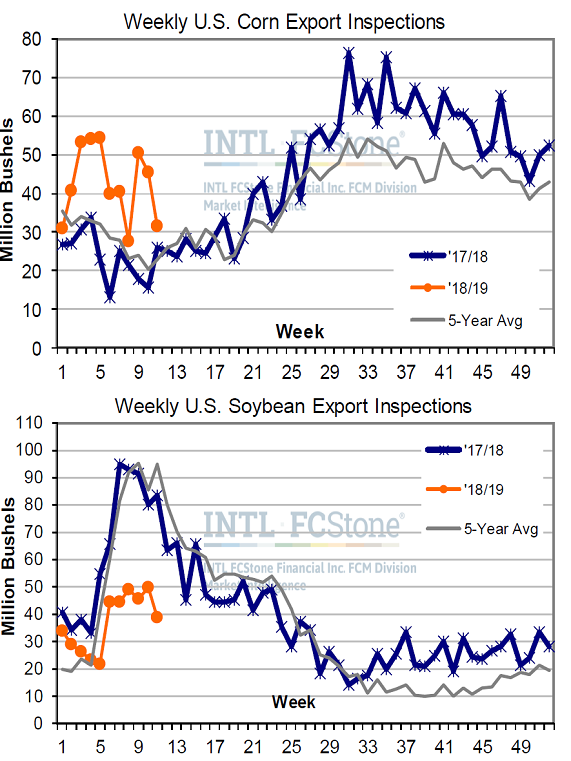 Corn and bean export inspections both fell off week-over-week, with corn down from 45.6 to 31.4 million bushels, and beans dropping from 49.8 to 38.8 mbu. Soy inspections look to be turning the corner with a “seasonal peak” only in the 46-50 mbu range, compared to 92-95 mbu last season. Cumulative inspections of 405 mbu are over 300 mbu behind last year’s pace, with the USDA looking for a –229 mbu entire-year drop.